In 1964 when Lyndon Johnson was President, he probably didn't notice that Eric Ridder had just sailed the 12-Meter Constellation to a 4-0 sweep over Great Britain's Sovereign to keep the America's Cup in American waters, even with a full crew of Americans on the boat. But if there was little interest in the Auld Mug, an imaginative Long Beach Yacht Club group intrigued by match race sailing and led by Bill Dalessi was busy creating a New Mug: the Congressional Cup. The next year it was born, with a collection mostly of outstanding amateur sailors from across the country racing one on one for no prize money on their own Cal 40s, and - whattaya know - it worked! Half a century later, with Dalessi still on the scene, LBYC will stage a three-part 50th edition of the event with a cast of professional talent from seven countries, including seven of the top eight in the world. The line-up for the Congressional Cup, to be held over 9-13 April, includes five former winners - Ian Williams of the UK (ranked No. 2), Mathieu Richard of France (5), Johnie Berntsson of Sweden (7) and Simone Ferrarese (8) and Francesco Bruni of Italy - plus the young shooting star now ranked No. 1 atop all of them: Taylor Canfield, 25, of the US Virgin Islands. They will be joined by the top four finishers among six competitors in the Ficker Cup the previous two days that includes New Zealand's Phil Robertson (4), Australia's Keith Swinton (6) and Americans Christopher Poole from Oyster Bay, N.Y., Dustin Durant and the always present Kiwi expatriate Scott Dickson from LBYC - plus a sixth former two-time winner: noted racer, sailing author, lecturer and instructor Dave Perry of Pequot, Conn., who will join the final fray if he survives the Ficker, named for Bill, the 1974 Congressional Cup winner. Perry starts his busy month in the Heritage Regatta on Sunday, 6 April, featuring six of the winning skippers from the early days: Scott Allan, 1967; Scott's older brother Skip, 1968; Tommy Pickard, 1971; Dennis Durgan, 1979 and '80; Scott Perry, 1982, and Dave Perry (no relation to Scott), 1983 and '84. They, too, will sail the Catalina 37s, but on a day of fleet racing, sponsored by the Port of Long Beach. All competition will be conducted before spectators on Belmont Veterans Memorial Pier. Heritage races will start at noon, Ficker at 11:00 and Congressional at 11:30, conditions permitting. Dalessi recalled 1964 when his committee bounced its notion off the New York YC, the longtime defender of the America's Cup: "We were interested in promoting match racing in a different format," he said. "Everybody would race each other one time and whoever had the most wins won it. We invited whoever we wanted. They were longer races outside the breakwater. Gerry Driscoll won 10 straight." Driscoll, a major San Diego boatyard operator, repeated a year later. He died three years ago at 86. Skip Allan spoke for all of the old-timers when he said recently: "The current crop of Congressional Cup crew's parents were not yet born when we won in 1968 ... but my Crimson Blazer still fits." Ah, the Crimson Blazers, worn by past winners now ranging around the world from nine countries, all since the mid-80s when the Congressional Cup became more international than Dalessi ever imagined. He received an honorary blazer along the way, recognition that LBYC had set the bar for world-class match racing, with a special touch. Dalessi and his guys persuaded Congressman Craig Hosmer and US Senator Tom Kuchel to sponsor official legislation endorsing it as the Congressional Cup. The guys who today make pretty good livings match racing won't be sailing Cal 40s, although there are still many around still going strong. They'll get their shots with the same sturdy purpose-built Catalina 37s that Catalina Yachts boss Frank Butler donated to LBYC in 1990 and the boats switched from privately owned Catalina 38s, which had succeeded the Cal 40s. Dennis Durgan, now 60 and a Newport Beach realtor, was the winner in 1979 and '80, after serving as tactician for wins by Dennis Conner (1973 and '75) and Ficker (1974). "I can't believe it's the 50th Congressional Cup," he said, recalling "coming from behind in a 25-tack duel from the leeward mark to the finish to beat Ron Doraghty by a foot, which gave us the win over Deaver and Rod Davis. There were so many tacking duels and jibing duels that you just don't see in today's racing. Great memories! "The Congressional Cup has to be one of the finest regattas in the world. The doors that were opened for me have been numerous ... meeting and sailing with and against all the great skippers and crews carried over into most of the major sailboat races around the globe. I am so lucky." The format was altered temporarily in 1995 when many of the world's leading skippers had a conflict: the America's Cup a hundred miles south in San Diego. 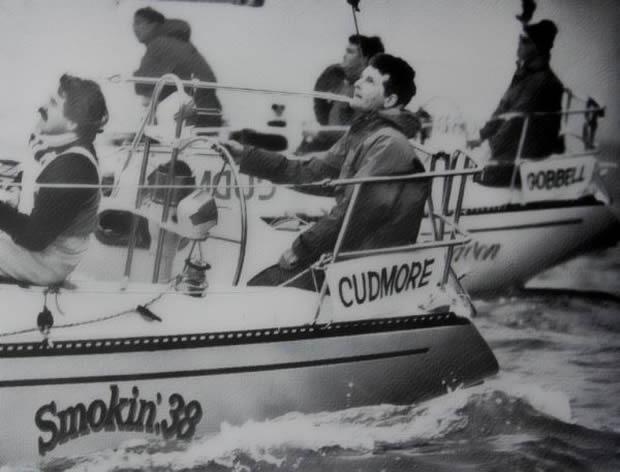 Rather than pass on the year, the late LBYC Commodore Bud Tretter rounded up a fleet of former winners for the 'Masters' match racing regatta, won by Harold Cudmore of Ireland. The fleet also included the colourful Ted Turner, who had followed up his win in 1977 with an America's Cup victory sailing Courageous later that year, earning immortality as 'Captain Outrageous'. But he was later to become known as the founder of CNN and as Time magazine's 'Man of the Year' in 1991. He also was married at the time to actress Jane Fonda, who joined him in Long Beach and rode along on the back of the boat on a practice day. Asked how she enjoyed it, she deadpanned: "I liked the part where we came in and sat around (the club)." Scott Perry, 65, now, like Dave Perry, residing in Connecticut, but no relation, represented the U.S. Naval Academy when he won in 1982. "My most vivid memory," he said, "was the last very close race with Rod Davis. After we won the start narrowly and led around the first lap, we were overtaken on the second weather leg. Near the leeward mark we crash-jibed to port to get inside and after a frenetic [spinnaker] takedown and rounding we were able to cover on the last leg and just beat Rod for the championship." Another tough loss for Rod Davis ... offset along the way by four Congressional Cup wins. Perry said: "Although I sailed in two America's Cup campaigns, had a successful college sailing career at Cornell where we won the Kennedy Cup, was head sailing coach at the Naval Academy while a naval officer and competed/won and placed in many offshore races, the Congressional Cup win remains my most memorable win." As for Dave Perry, his memory "of our wins in 1983 and 1984 are equal parts blurry (a combination of the champagne at the time and age) and clear as if it was last year. My memories include the incredible amount of work by the volunteers to prepare the Catalina 38s for us to race, and then even more work preparing to return them to their owners ... the team whose engine stalled while docking and wound up sailing six feet up onto the dock, and their burgee signpost being replaced the next day with a stop sign." Then there was the night in his 1984 win when he paced in agony under a full moon outside the club as a final, decisive protest was heard by all nine judges, with a witness from a helicopter overhead ... "and a whale sounding right under our bow as we were careening downwind in a heavy air race." Eight years later, weary of late night protest hearings back at the club, then-LBYC Commodore Pete Ives, with input from influential sailing leaders, introduced on-water umpiring that revolutionised the game worldwide for competitors and spectators as far up as the America's Cup. One other key factor noted by competitors, past and present, is the Congressional Cup's high level of organization with a unique volunteer force of some 300 club members and their families. Each crew is assigned boat hostesses and a housing team to deliver the outstanding local hospitality the Congressional Cup has offered now for half a century of world-class sailing.